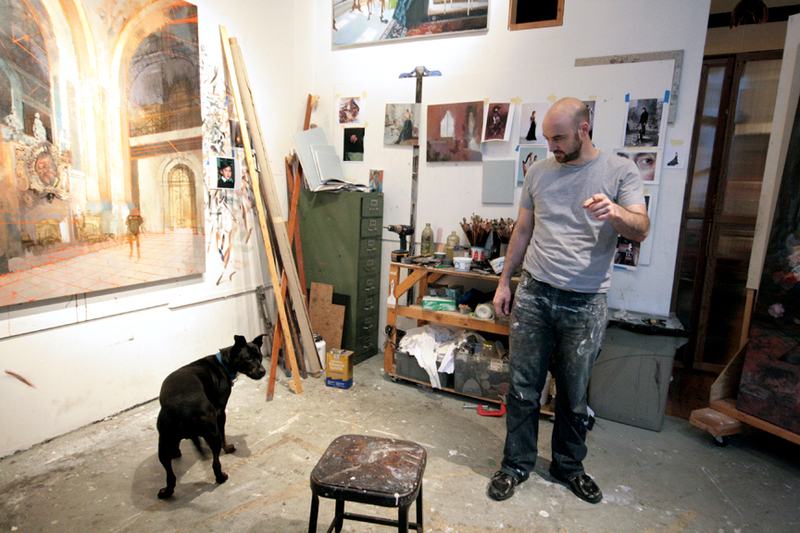 Tim Kent in his studio with his pup, Petunia. Built up and built out and consistently reconfigured in sometimes nearly imperceptibly different iterations, Tim Kent’s home studio is a now completely shifting, now gently morphing composition of spatiality in flux, a locus of nudging and restructuring of layouts and lighting that not only reflects the variant needs of a deeply skilled painter and draughtsman working at times with live models and at times from architectural renderings, but that is also reflected in many of the works themselves. 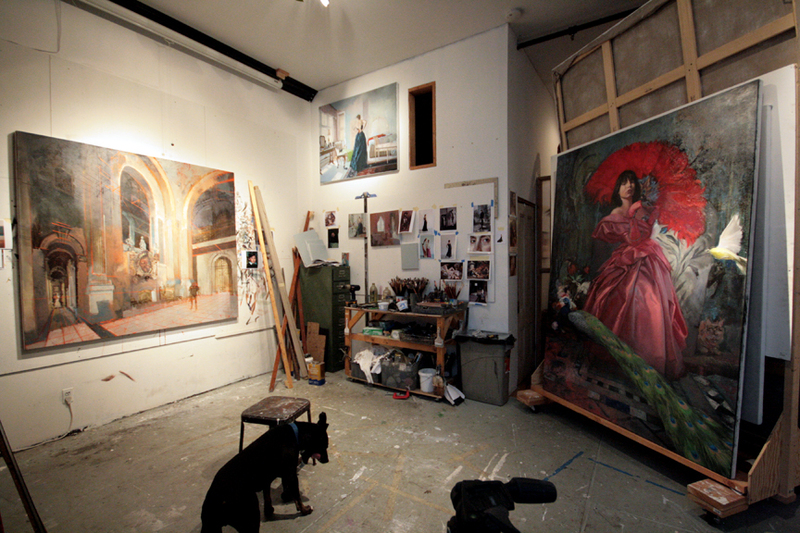 In a number of paintings and drawings, for example, one sees great vaulted ceilings soaring above grandiose interiors inhabited by various fineries of color and décor, yet still visible at times is the compositional logic beneath it all, the traces of planning and retractable traces replanned, the spatial plotting of objects and the rushing in, or trickling through, or pouring on of light. These works are about air, in some sense, and how objects bear weight; they are about light flitting through rooms and making things dance, at times, while other times planting them firm. Figures do occasionally play cameos in these works, but they remain extras in indifferent focus. In these grand spaces, vacuity reigns over realms of marble-clad echoes. Note: Figures elsewhere, to be sure, are the stars. 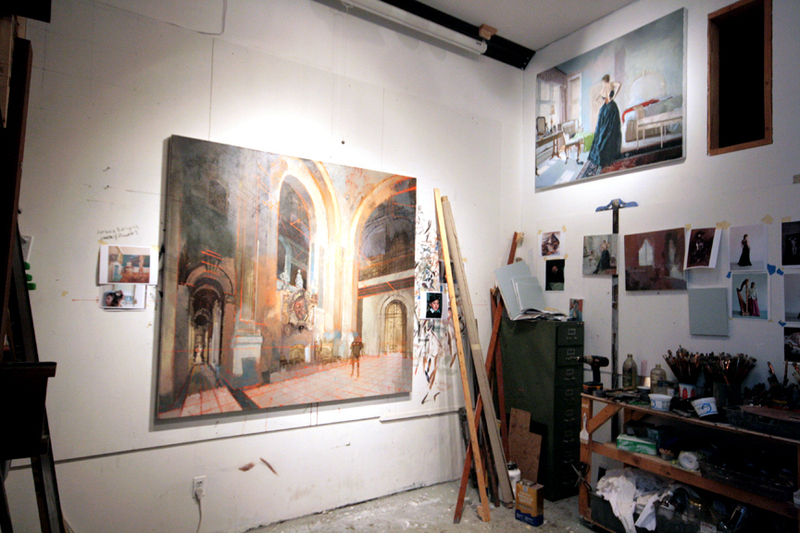 Exemplary of Tim's spatial renderings is, left, C.H.3 - Rapture, 2011, oil on linen, 64"x68". Although a constant in Tim’s historical references and stylistic predilections is the rigor of classical mores and molding, his works are nonetheless unmistakably innovative, definitively contemporary. His bold, daring compositions featuring now lush interiors or variably reposed figures, now objects inert or writhing creatures, are rendered electric through masterfully executed, nuanced brushwork. He portrays the aura of atmospheres rather than the mere layout of spaces, the minutiae of fervid moods and moments rather than simply more or less emotive faces. In a single work, Tim might nod knowingly – through his skilled exploitation of the vicissitudinous character of light, for example, or in his firm grasp of the fleshed torque of human forms – to influences and painterly forebears ranging from the Renaissance to the modernist canon, yet the same work will bear his uniquely dexterous stamp per force. His nods to history, in other words, read more like discerning, perspicacious glances: a forlorn gaze evoking the impassioned visages of Pontormo; items on a table rendered in the fragile palette of Cézanne; a playfulness with brushstrokes and borders in works that breathe, with fresh charm, Boldini. The temperament, however, is subtly different. Apparently softened forms display a distinctive vigor and angularity; sfumature are deployed selectively rather than overall and throughout; countenances are often blank, or blankly fraught, or blankly lewd or lascivious – elusive forms of expressive mystique. Tradition informs, in other words, then retires from Tim’s primary norms. Ms. R.L. 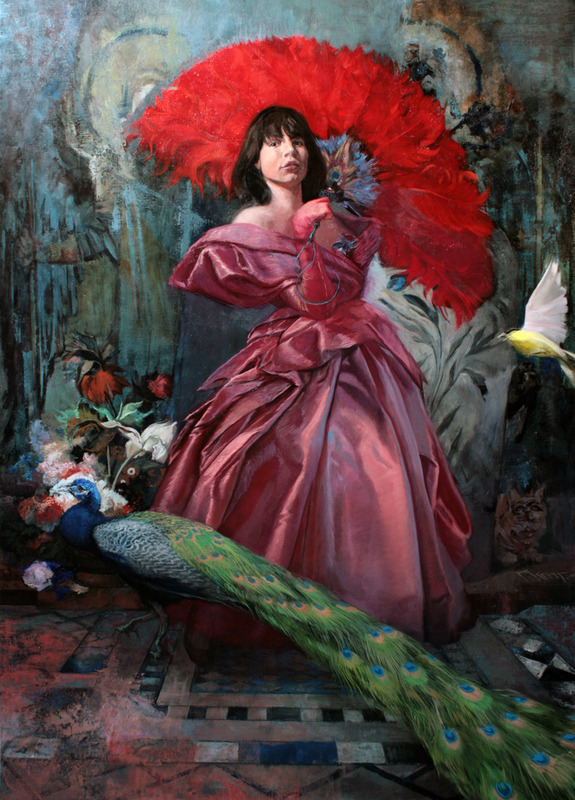 in Pink and Red, 2011, oil on linen, 82"x60". Take, for instance, Ms R.L. in Pink and Red, a great canvas that is as effulgently theatrical as it is descriptive, as chromatically festive as it is also, somehow, fearsome. There, in arrested strut, in paused lunge, she is poised: insouciant or intrepid, in some sort of glory unfurled, her subtle sass effervescent in the faint pucker of her face, in the glint in her eyes, in the lithe bend of her wrist, in her fan-grasping hand, in the angling of her hips, in the feathery flaunt of her static ecstasy with fragile flora all around and a great peacock, no less, at her feet. Behind her loom, in enigmatic obscurity, some sorts of spectral gazers; creatures creep about or flutter into the red thrust of the scene, as do a few well-elected hues of piquant blues. So much emblazonment with decadent, lush magenta, with the majesty of late-empire pomp. The empire in question is largely irrelevant. She is a sly angel from some end time to come. Note: I do not know who Ms. R.L. is, nor do I know if I want to know her. I know very well, however, that she is only one of Tim’s many stellar figures elsewhere. Evocations reverberant from vast room to plush plume.